Ein ungefärbt Gemüte (An open mind) (literally: An undyed mind), BWV 24,[a] is a church cantata by Johann Sebastian Bach. He composed it in Leipzig for the fourth Sunday after Trinity and first performed it on 20 June 1723. It is the third new cantata of his first annual cycle. The title has been translated more freely, for example as "An unstained mind", "An unblemished conscience", "An undisguised intention", and "An unsophisticated mind". Bach composed the cantata for the fourth Sunday after Trinity and first performed it on 20 June 1723, three weeks after he took up the position as Thomaskantor in Leipzig with Die Elenden sollen essen, BWV 75. Bach had begun to compose one cantata for almost every Sunday and holiday of the liturgical year, a project described by Christoph Wolff as "an artistic undertaking on the largest scale". It seems likely that Bach performed in the same service also the earlier cantata Barmherziges Herze der ewigen Liebe, BWV 185, composed for the same occasion in Weimar in 1715. He had presented cantatas in two parts on the preceding three Sundays, the new works Die Elenden sollen essen, and Die Himmel erzählen die Ehre Gottes, BWV 76, and the earlier Ich hatte viel Bekümmernis, BWV 21. On the fourth Sunday he likely performed one cantata before and the other after the sermon. According to Christoph Wolff, he probably performed the new work first. In his composition, Bach stresses the weight of the central biblical quotation by giving it to the choir, and by scoring the framing recitatives and arias with reduced accompaniment. The obbligato part in the first aria is played by the violins and viola in unison and resembles the vocal part. According to John Eliot Gardiner, Bach thus evokes an "unstained mind". Julian Mincham notes the "sombre and shaded tone quality" of the unison strings. The following recitative, termed an "exemplary mini-sermon in its own right", is secco and ends in an arioso. Here as in the first work for the same occasion, BWV 185, Bach shows the mirror effect of the words, "Mach aus dir selbst ein solches Bild, wie du den Nächsten haben willt!" (Make yourself into such an image, as you would have your neighbour be!) by imitation of voice and continuo. This phrase is rendered three times. The central choral movement, "a powerful chorus which forms the core of the cantata", is in two sections: the complete text is once rendered in a free form, then again as a fugue, comparable to the concept prelude and fugue. 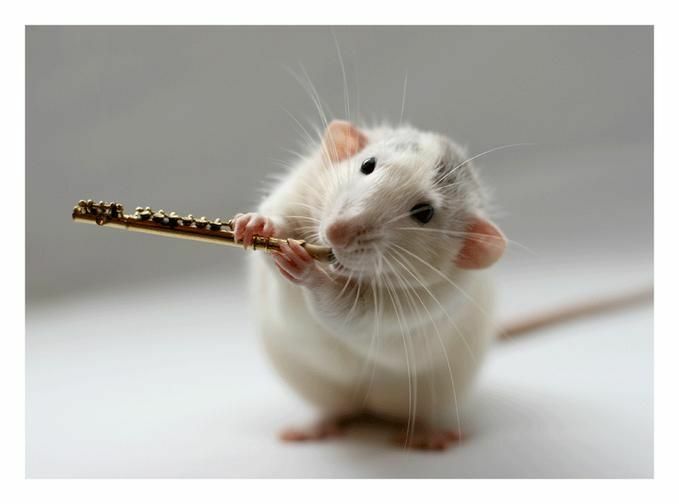 Two oboes double the strings, a clarino plays an independent part. The prelude is in three symmetric sections. The fugue, a double fugue marked "vivace allegro", begins with the first vocal entrance only accompanied by the continuo, the first vocal entries are sung by the concertisten, the choir joins later. The music reaches a climax when the clarino plays the theme as a fifth part to the four vocal parts. The movement ends in free sequences. Mincham describes the "ceaseless activity through constant musical movement" of the music, the "fragmented rhythm" of the countersubject and the "breathless urgency" of the coda. The following recitative is similar to the first in structure, but accompanied by the strings adding emphasis, mostly on strong beats. The final arioso, without the strings, stresses the prayer "Der liebe Gott behüte mich dafür!" (May dear God spare me from it!). The last aria is accompanied by two oboi d'amore; they play a long "doleful" introduction that is repeated as a postlude. The voice picks up their beginning motif. The tenor voice sings an unusual coloratura line when the text ends on "Macht uns Gott und Engeln gleich" (makes us like God and the angels), possibly representing the multitude of the Heavenly host. The eight lines of the closing chorale in homophonic four-part vocal setting are richly framed by orchestral interludes and accompanied by the instruments. Bach found the style of chorale treatment in works by his predecessor in Leipzig, Johann Kuhnau. The last prayer asks for "ein unverletzte Seel" (an unsullied soul) "und rein Gewissen" (and a clear conscience). The cantata in six movements is scored for three vocal soloists (alto, tenor and bass), a four-part choir, clarino, two oboes, two oboes d'amore, two violins, viola and basso continuo. 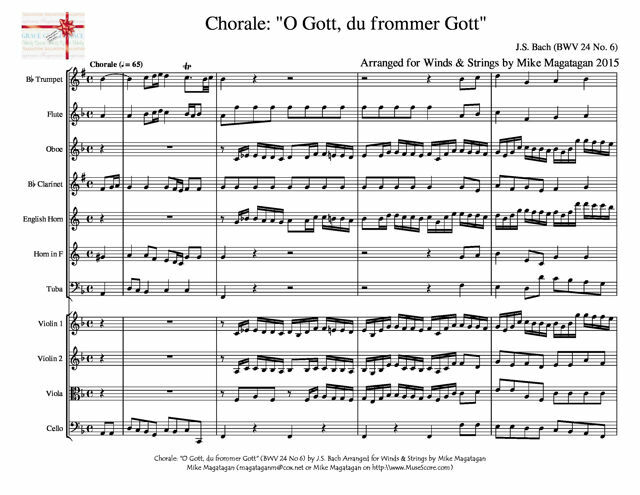 I created this arrangement of the closing Chorale: "O Gott, du frommer Gott" (O God, You righteous God) for Winds (Bb Trumpet, Flute, Oboe, Bb Clarinet, English Horn, French Horn & Tuba) & Strings (Violin, Viola & Cello).